This series takes a look into learning to wakeboard at WMSki on their System 2.0 cable. If you have any questions or would like us to cover anything specific then please drop us a message in the comments below. After many months of badgering from one of my colleagues & wanting to try something new I decided to try learning to wakeboard this summer. It’s been many years since I last engaged in a watersport, naturally I was both apprehensive & excited to give wakeboarding a shot. In recent years I’ve mainly spent time on snowboards. 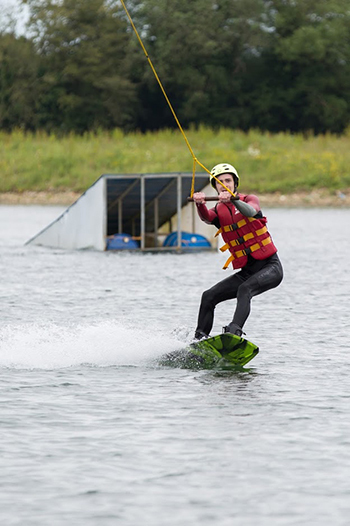 Fortunately for me, riding a snowboard was actually very beneficial when it came to wakeboarding. After a friendly welcome by the WMSki staff, I was kitted out with a wetsuit, buoyancy aid & helmet. Their selection of equipment covers all ranges of ages & build sizes. My ride for the day was a Ronix Bill wakeboard with Hyperlite System bindings provided by none other than ATBShop, of course. Unfortunately it wasn’t quiet warm enough for the rash vest & boardies I’d brought along with me, at least not for a beginner thats going to be spending a lot of time in the water rather than on top of it! On a side note, there are currently no proper changes factilies at WMSKi; they have a cabin you can use if you need some privacy otherwise the best advice I can give you is to take a Mystic Poncho Robie for getting changed! I was given an informative yet informal chat with one of the instructors covering exactly what to expect, what happens if something goes wrong & instructions on standing up for the first time. It was then time to strap into the board & wait for my turn, I can’t deny that I wasn’t a little nervous when I was strapped in with my legs & board hanging off the dock. Once my turn came around after anxiously waiting, I was lowered into the water bottom first with my legs out ready for my maiden voyage across the System 2.0 cable. It was quiet a shock being lowered into the water in this manner but you soon adjust to it & thanks to the lovely weather we’ve been graced with so far this summer, the lakes temperature wasn’t bad at all. The best thing about the WMSki’s System 2.0 cable? Its perfect for beginners. Only a single person can ride at a time meaning you get 100% of the staffs attention and the cable speed is variable so it can be slowed down for beginners or sped up for advanced riders. Now sat in the water, I was ready to go. With a thumbs up the cable slowly began to pull. I was told the trick to getting up & going isn’t to turn the board straight away, rather to let the power build up with the board sideways then slow allow the board to turn with your best foot foward. After two failed attempts & a mouthful of lake water I was stood up & heading towards to the other side of the lake. 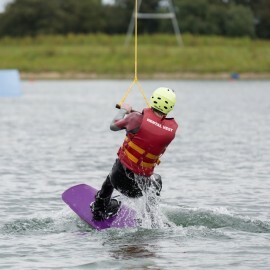 The feeling of standing up for the first time was quiet unexpected, as I said I’m used to riding on snow but standing up on water was just something else all together, it was brilliant! After going back & forth several times, I began to feel a lot more comfortable. Under instruction of the staff I than begin progressing with little turns on my heel & toe edge. Turning on a wakeboard follows the principle as all other boardsports, simply apply the pressure to the edge, keep your weight centered & let the board do the rest. Towards the end of my session I started to attempt riding switch & turning the corners. Turning the corners on the System 2.0 cable involves riding your heel edge with some power to get enough speed to make the turn, as the power begins to drop the cable operator switches the cable direction which in turn pulls you around ready to head back across the lake. It might sound easy but expect a few dips in the water when your first learning. I unfortunately didn’t manage to nail turning corners on this session but I’m eager to get back in the water & practice. Thanks to the staff at WMSki & keep an eye out for Session #2 coming soon. In the mean time you can find out more about WMSki here. DRY Bag Elite & Pro- Finally a solution to all your wetsuit drying problems!